As we constantly strive to achieve the goal of providing all of our customers' needs, we have added a Mitsubishi 3718 LV Plus Laser to our capabilities! The LV Plus series is at the top of the class for heavy duty, high performance laser cutting. With its new, more advanced 40 CFX resonators, the 4000 watts of this LV series machine is a showcase of the latest enhancements of Mitsubishi's cross-flow laser cutting technology. The high-speed, heavy-duty Tower, with its eight integrated, low profile shelves each with the ability to hold 6,000 lbs of material, maximizes the turnaround time for your project. This gives us the ability to stock material for the quick turnaround of your laser-cutting project, sometimes resulting in your parts in hours instead of days. Imagine how this would reduce your project time! The Mitsubishi Laser can produce your laser cut parts from Mild Steel (up to 1 inch thick in sheets up to 6' x 12'), Stainless Steel (up to 1/2 inch thick in sheets up to 6' x 12'), and in Aluminum (up to 3/8 inch thick in sheets up to 6' x 12' in size). The variety and complexity of laser cut parts are limitless, having many advantages over other conventional metal cutting and metal fabrication processes. 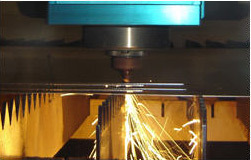 We can cut complex parts, thick parts, heavy plate, and hard materials while leaving burr-free edges. Laser cutting produces parts with virtually no distortion, making it your kind of process... well suited for prototyping, short runs, or production. We use the Ward Jet ZX-813 waterjet for the latest in water cutting technology. Where the laser leaves off, the water jet takes over with its ability to cut non metalic materials, plastics, rubber, glass, marble, ceramics, and fume emitting materials like copper. The cutting bed size is 97" x 145" and materials up to 8" thick can be cut. Its ability to cut three 4'x8' sheets at the same time allow us to get your parts done fast, and with tolorances of ± 0.001" accuracy is never an issue. JIT Global Enterprises has the ability to perform virtually any welding process your project may require. Quantities from one piece to thousands of parts are no problem for us. We use the latest equipment to stay up-to-date with the most current technologies. We use Lincoln Electric’s Waveform Control Technology™. The use of this process enables the welding department to be more adaptive to your welding needs, with increased weld quality, and productivity. As a result, a wide variety of ferrous or non-ferrous materials can be joined using welding processes such as: Shielded Metal Arc Welding (S.M.A.W. ), Gas Metal Arc Welding (G.M.A.W. ), Flux Cored Arc Welding (F.C.A.W. ), Gas Tungsten Arc Welding (G.T.A.W. ), Resistance Welding, as well as Gas Welding/Brazing, and Soldering. We rely on Meta-Lax to provide us with the capability to create welds with fewer deformations and cracks than our competitors. By adding sub harmonic energy during welding (Meta-Lax Weld Conditioning or Pulse Puddle Arc Welding) it is possible to prevent normal weld distortion and cracking by 50 - 90%. In doing so other benefits like welding faster, reducing pre-heat, and reducing porosity may also be realized. We can then pass the savings on to the customer.